Making your own party canapés needn’t be fiddly. 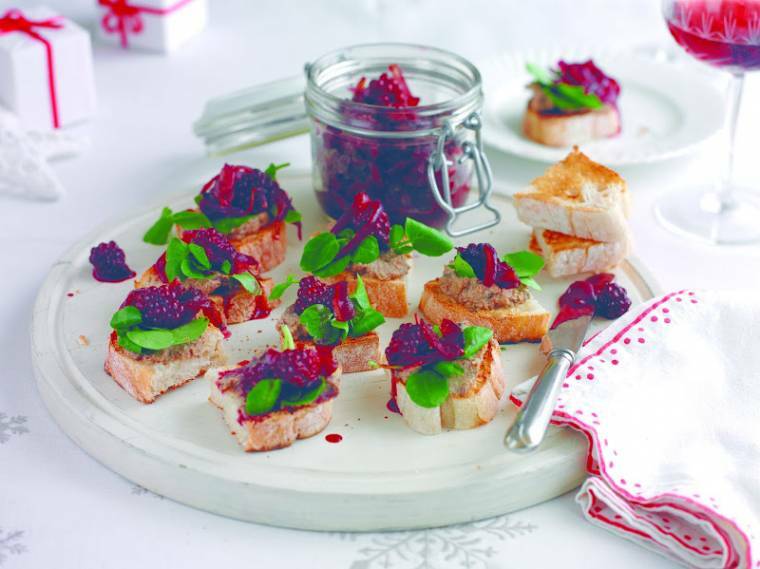 The pate can be made in less than 15 minutes the day before then simply spread on toasted ciabatta and topped with a little watercress and a spoonful of this very moreish blackberry chutney. To make the pate, add the chicken livers to a sieve, rinse with cold water, drain well then tip out on to a chopping board. Roughly chop, discarding any central white cores. Heat the oil in a frying pan, add the onion and fry for 5 minutes until softened and just beginning to turn golden. Add the butter, heat until melted then mix in the garlic and chicken livers. Fry for 3-4 minutes, stirring until the livers are browned but still pink in the centre. Add the brandy, heat until bubbling, then flame with a lit taper or long match. Stand well back until the flames subside, then stir in the stock, salt and peppercorns. Cook over medium heat for 3-4 minutes until some of the stock has evaporated. Allow to cool then blitz in a food processor or liquidiser until smooth. Spoon into a dish, cover and transfer to the fridge when cool enough. To make the chutney, heat the oil in a large frying pan, add the onions and fry for 10 minutes, stirring until softened. Stir in the sugar and fry for 5-10 more minutes, stirring more frequently until the onions are caramelised. Mix in the vinegar, blackberries and a little salt and pepper and cook for 3 minutes until the blackberries are just cooked through. Take off the heat, spoon into a clip jar, cover and leave to cool. To serve, slice and toast the bread, cut each slice in half again then spread with the chilled pate, a leaf or two of watercress and a generous teaspoonful of the chutney. Arrange on a large plate and serve with drinks. Tip: Store any leftover chutney in the fridge as it has only small amounts of vinegar and sugar. "16/11 Link Up Your Favourite Posts This Week : Welcome To The Weekend Hop …"
"Blackberry And Blueberry Christmas Cake"
So colourful! Looks yummy Clairejustine!